ALBANY, GA (WALB) - WALB-TV was started by the Albany Herald, and its owner, James H. Gray, Sr., in 1954. The Herald entered broadcasting 13 years earlier, when it built WALB-AM radio. WALB-AM signed on in May of 1941, six months prior to America’s entry into World War II. In 1953, the FCC granted a construction permit for WALB-TV on Stuart Avenue, which in that era, was a dirt road through a pecan grove. When the TV station was completed in 1954, the radio staff was brought over from the Dunbar Lane transmitter site, and remained with TV until the radio station was sold to Allen Woodall, Sr., of Columbus, in 1960. WALB's staff totaled 18 employees at the beginning. When the station celebrated its 25th birthday, that number was 63. Currently, there are almost 100 on the WALB staff, including the Valdosta and Thomasville Bureaus. For its first three years, WALB's signal was 112,000 Watts, and came from the 426-foot tower on Stuart Avenue. In 1957, a 1,000 foot tower was built at its current broadcast site near Doerun, and the power was raised to 316,000 Watts. The signal is seen from Monticello, Florida in the south to Pinehurst in the north, and from Blakely in the west, to Douglas in the east. WALB is also seen on over 50 cable systems all over South Georgia, and two satellite services, DirecTV and DISH. In March 1976, the main studio portion of the station burned, but the business offices and transmitter link were saved. Using spare and borrowed equipment, the station got back on the air within a day, broadcasting from its shop building. 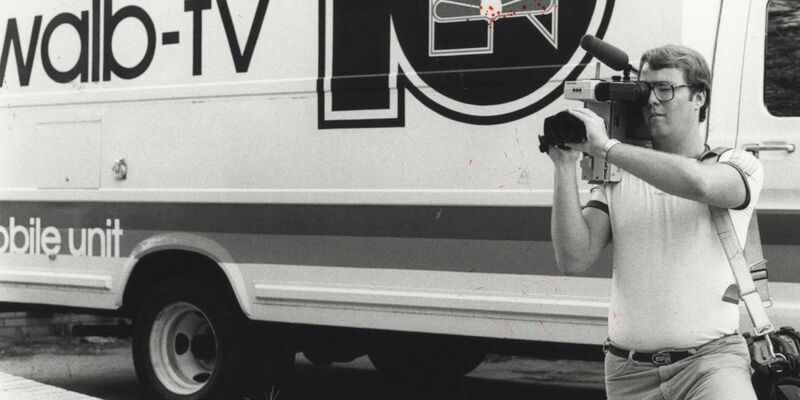 In 1982, Gray, the station’s owner, assisted in the birth of a competing TV station, WTSG Channel 31. That station’s tower was erected beside WALB’s tower at its Doerun broadcast facility. WALB operated as the flagship of the Gray Communications Corporation until the Liberty Broadcasting Corporation bought the station in 1998. Gray sold WALB so the company could acquire WCTV in Thomasville-Tallahassee from Phipps Communications. WALB was purchased by the Liberty Corporation in 1998, and then in 2006, WALB was one of the Liberty stations to be purchased by Raycom , which also owns WTVM in Columbus, WFXG in Augusta and WTOC in Savannah. WALB entered the world of “digital” news in July 1997, when the station began an affiliation with MSNBC. We continued to serve a small but growing internet audience with MSNBC until May of 2000, when the station ended the arrangement with MSNBC, and started its stand-alone news website, as an affiliate of Liberty Broadcasting, using the WorldNow publishing platform. WALB suffered another crisis on June 1, 2006, when an Army Chinook helicopter from the Night Stalker special forces unit struck the upper section of the WFXL broadcast tower, which stood close to WALB's tower at the Doerun transmitter facility. There was only one survivor of that crash, which happened in dense fog. WFXL's tower was damaged so severely that engineers decided it had to be brought down. They were concerned immediately that the close proximity to WALB's tower would cause guy wires from the falling Channel 31 tower to wrap around Channel 10's guy wires, and pull it down, as well. When they set charges to cut the damaged tower's wires, that's exactly what happened, and two 1,000 foot tall towers hit the ground around the transmitter building, which survived. The towers cost one million dollars each. Engineers switched to a back up transmitter on Stuart Avenue before the towers came down. WALB continued to broadcast from its studio until a state of the art tower, ten feet across on each of its three sides, could be erected. That tower now supports the antennae for both WALB and WFXL. In 2008, WALB began offering video of its TV news coverage on its website. This feature began to include live broadcasts of its news programs soon there after. These are also available on our WALB News 10 mobile app. In January 2019, WALB was reacquired by Gray Television. WALB continues to set the pace in South Georgia television. Our news operation informs viewers seven days a week, with newscasts beginning at 5 a.m. and 6 p.m. on the weekends. WALB prides itself on service to the South Georgia community, and devotes a significant portion of air time, in-kind services, and promotional support to worthy causes.